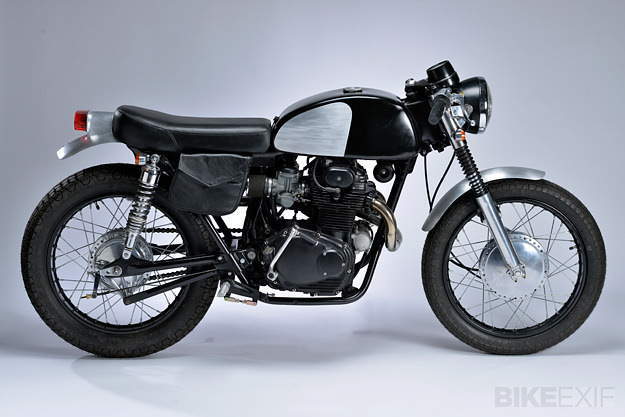 The terms ‘hand crafted’ and ‘bespoke’ get thrown around a lot these days—but in the case of this wonderfully understated 1969 Honda CB350, they’re particularly apt. Virtually every part you see here has been hand made by Sean Pelletier of Roc City Cafe Racers. At Roc City, Pelletier’s primary focus is fabricating café parts for vintage motorcycles. But, when he finds the time, he also likes to tackle complete builds from his Rochester, NY workshop. 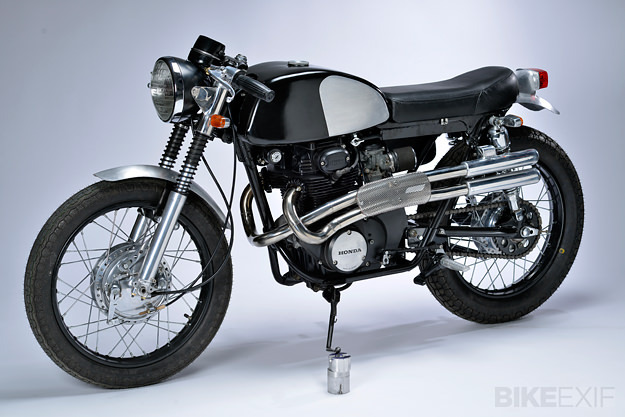 The CB’s twin cylinder engine was left stock, but overhauled for the sake of reliability. Uni Filter foam filters were added—an increasingly popular choice among builders for their stealthy looks, along with new rubber from IRC. Using aluminum, Pelletier fabricated the new fuel tank, the front fender, and the one-piece rear fender and tail light unit. 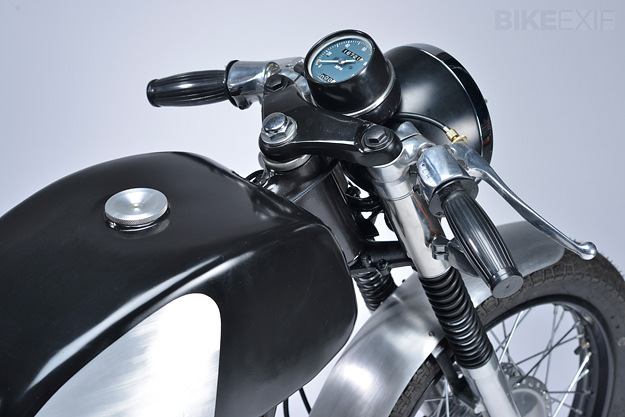 The clip-ons, rearsets and top yoke are all cast aluminum—which he actually poured himself. 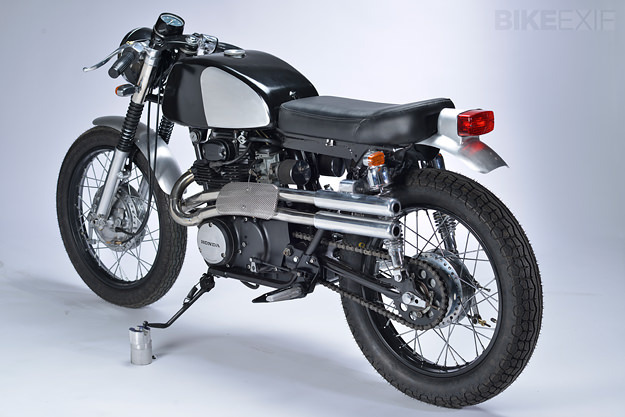 “It’s something I’m playing with, and I think I’ll be doing some really neat things with it in the near future.” Other in-house items include the headlight ears, custom seat and tool bag. 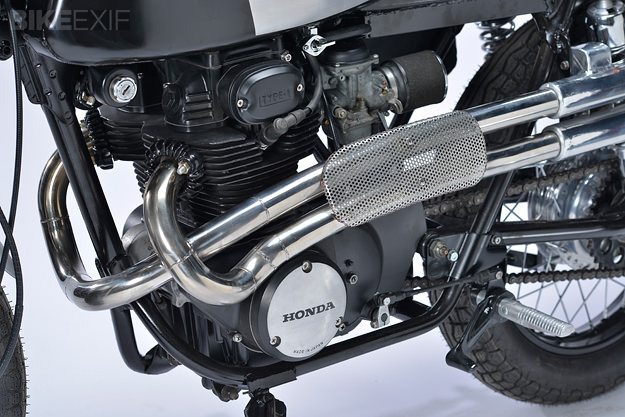 And, of course, the beautifully sculpted high-riding exhausts. I’d say he nailed it. Head over to the Roc City Cafe website to browse a tempting range of classy parts for your next cafe racer build.